Layers and layers of chocolate chip cookies and spiked cream come together for this amazing Cookie Icebox Cake. 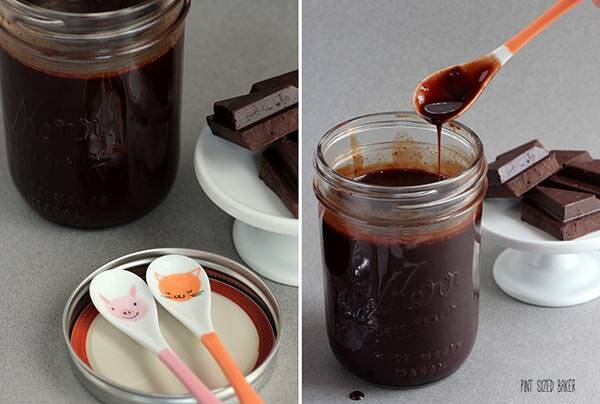 Make it the night before and then cover it in homemade chocolate sauce. 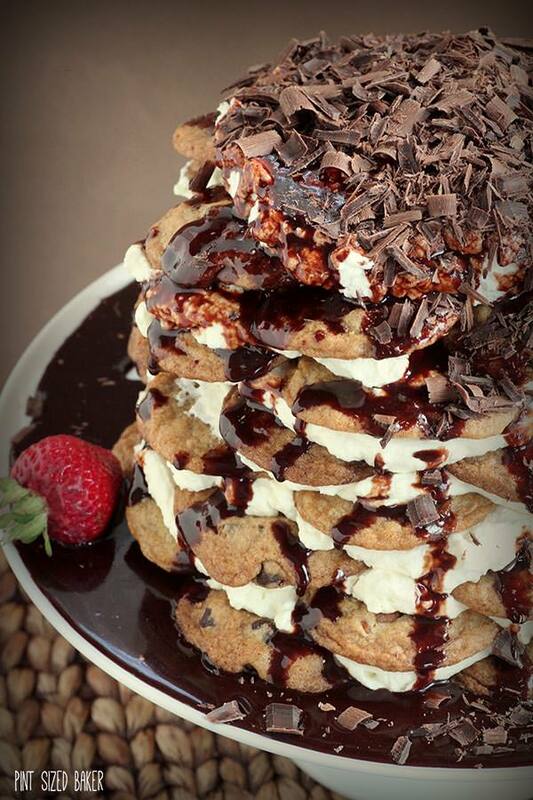 I think I may have outdone myself here… What do you think of this gorgeously stunning Cookie Icebox Cake? It’s the first Icebox Cake that I’ve made and had. I was telling my Mom about making this and how good it was and she told me about how my Grandmother used to make Icebox Cakes with chocolate wafers. Ummm… where were these cakes when I was a kid Mom? Why did you not make your mother’s desserts? Thank goodness for Martha Stewart to fill me in on the awesomeness of this dessert. To add to Ms. Stewart’s recipe, I made some homemade Chocolate Sauce to pour over the top. Also, I found these adorable spoons while at Epcot and wanted to show them off… I wanted one in each color, but just got these two cute ones. It was so hard to resist all the cuteness! This was the first time I made an Icebox Cake and it’s the first time that I made my own Chocolate Syrup. All I can say is, why didn’t someone tell me how good homemade chocolate syrup was?? Oh my! I hope that you like my little video on making this cake. I hope to make more videos and animated .GIF’s of my treats. Aren’t they fun? Did you like that? Mr. Quart decided to help… Thanks babe! This Icebox cake could be made with store bought cookies and chocolate syrup, but it's so much better when it's all homemade. In a small pot, bring water and sugar to a boil and whisk in cocoa, salt, and corn syrup. Whisk until all of the solids have dissolved. Reduce sauce until slightly thickened. Stir in whisky if desired. Strain and cool to room temperature. Transfer to a mason jar and refrigerate. Layer the cookies and mascarpone whip cream and refrigerate overnight. The next day, whip cream until soft peaks form and top the Icebox Cake. Drizzle desired amount of Chocolate Syrup over cake. Cut with a large serrated knife and share with great company. 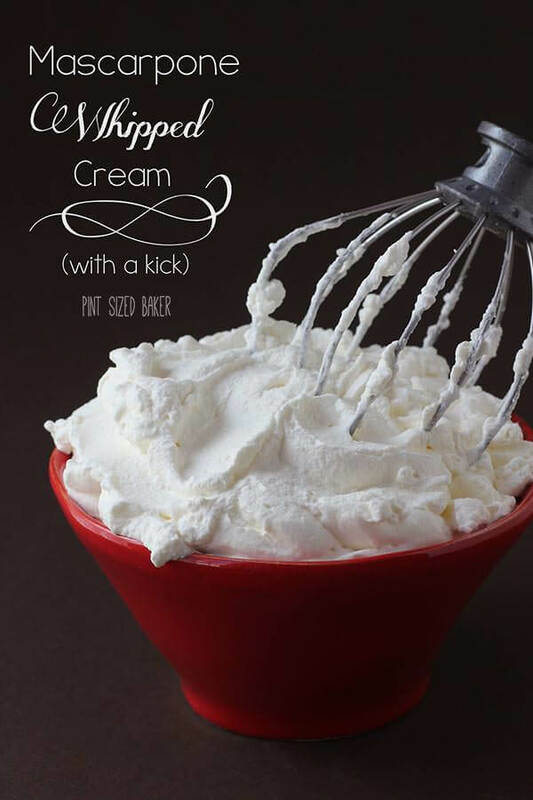 For the Chocolate Chip Cookie Recipe, click HERE and for the Mascarpone Whipped Cream Recipe, click HERE. Thanks so much Amanda! The .gif really makes me want another slice! All thanks to your tutorial! Love the picture of the chocolate pouring over the cake!!! How did you do that??!! I did make this cake (sorry, I used store bought cookies!) and everyone here in Hawaii just loved it!!! Amanda from above ^^^ had a great tutorial that I followed. So glad that everyone enjoyed it. Kisses! oo wow, wow, wow! This is perfect for “Dieters Downfall” haha. I love ice box cakes, I can only imagine how wonderful this is! Love the video too! Thanks Angie. I loved the extra surprise of the cinnamon chips and the whiskey. So much yumminess in one (large) bite! dang Karyn! you trying to kill my thighs? never mind. it’s too late. Thanks so much for stopping by from Friday Flair! Love it there! Thanks Nessa! This was exactly why I wanted to learn how to make them. Totally makes you drool for more! This looks amazing. We are hosting an extra special month long linky party through all of July focusing on frozen Summertime treats and we would love for you to join us! The best part is there is also an amazing GIVEAWAY! To get in on the action please visit us at We Scream for Ice Cream Linky Party + GIVEAWAY! Live from July 1st until July 30th. Hosted by: Dana @ This Silly Girl’s Life & Parrish @ Life with the Crust Cut Off We hope to see you there! Thanks so much for the invite over. I’ve linked up a few other recipes at your Ice Cream party! Wow! That does look amazing!! I love the GIF, too! Thanks so much! I really wanted to make one for this post and didn’t even know what they were called! Thank goodness for friends who knew what I was talking about! This is epic (and I LOVE that gif!) Nice work! So grateful to have you stop by. I love everything about Dine & Dish! Thanks so much! SHUT THE FRONT DOOR!!!…….. sorry to yell, but Karyn that looks and sounds amazing!!! LOVE! Where have you been all my life? YIKES this is one dangerous dessert that I have got to try ASAP!! Thanks so much for sharing! Oh my goodness. This looks incredible…and dangerous, lol. Your blog is very appropriately named! 🙂 I popped over from House of Hepworths! Thanks for sharing! Thanks so much! When I was thinking of blog names I didn’t want to hide the fact that these are decadent desserts, so thanks! 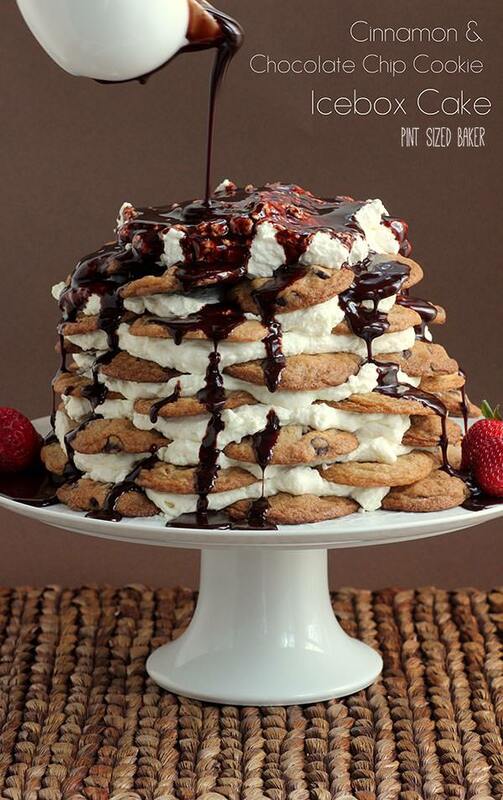 OMG – talk about making reader’s mouths water LOL – this look absolutely amazing – pinning it for sure! Visiting from Weekend Wonders- love the .gif! 🙂 I have something like this pinned- I need to try one ASAP! I really enjoyed the added flavor of the cinnamon chips! I highly suggest it if you do give it a shot! Oh my goodness Karyn! I want some… 🙂 It was a surprise finding your name and sweet face under a new site! Congrats on the second site and good luck! Keep making those amazing dieters downfall recipes! 🙂 Featuring you this week on Saturday Show & Tell! Yep! I’ve got two babies and they keep my very busy! Thanks so much for featuring me! I just linked up! Oh WOW! This is one gorgeous cake and I want to eat my way out of it! Thanks 🙂 I highly recommend it. Very impressive looking cake. 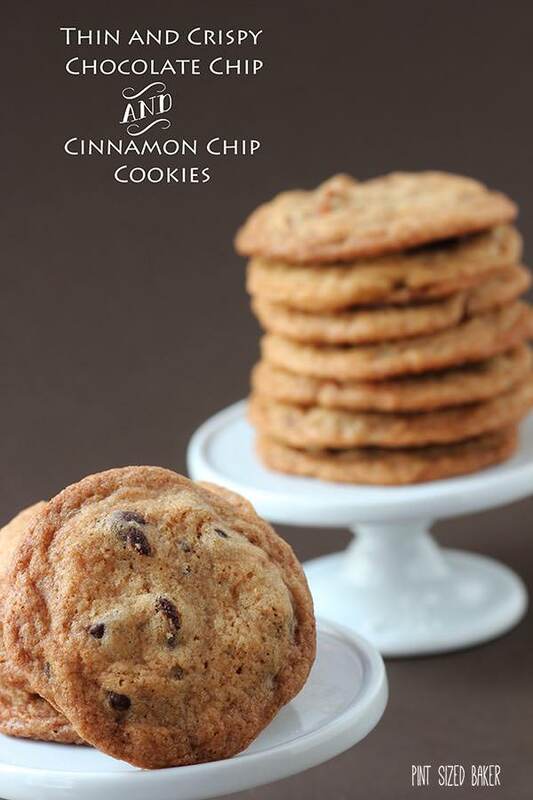 You can’t go wrong with chocolate chip cookies! Or Cinnamon Chip Cookies 🙂 Thanks for stopping by! This ice box cake looks so delicious i just had to pin it. Thanks for sharing at Thursdays Treasures. Well this is just amazing Karyn! I can’t even imagine the reaction I’d get pulling this baby out of the fridge 🙂 Pinned and featuring tonight! Thanks so much Lyuba! Much appreciated. Oh gosh. Words cannot describe the place I am in right now:p Or maybe dieter’s downfall is an accurate description!! Haha! That’s the whole point! Thanks for stopping by.